The author finds that even short trips to provide care for underserved communities can have powerful effects. Ophthalmology lends itself to effective outreach in resource-poor settings. Historically, cataract surgeons in particular have maximized their opportunity to provide a uniquely effective public health intervention: addressing a common pathology with a highly reproducible surgical procedure that provides dramatic results and a permanent therapeutic outcome needing minimal postoperative care. Those of us who trained in the posterior space may wonder if an equivalent scenario exists for us. We believe it does. To support our belief, this article offers details from our recent travels. • For short-term ophthalmology outreach efforts, maximizing the efficiency of one’s visit involves creating the greatest possible concentration of patients with a target pathology and providing access to the appropriate therapy through education and intervention. • Depending on available human resources, staff training, patient referral networks, and actual physical resources, appropriate involvement may range from a high-volume primary intervention to more intensive education-focused visits. • Retina surgeons have opportunities to provide effective interventions in resource-poor environments, even on short-term trips. Dr. Cunningham’s connections to the Jamaican community are deeply rooted: Both of his parents are from Jamaica and spent their lives there before migrating the family to New York. Dr. Cunningham himself spent numerous summers there as a child. After completing a surgical retina fellowship at the University of Iowa, he joined the Florida Retina Institute and set about building his practice, but the desire to return to Jamaica to provide eye care to those most in need stuck with him. Diabetes mellitus is endemic in the Jamaican population, with an estimated prevalence of 9.1% in men and 14.5% in women (11.9% overall).1 Access to primary care can be limited, and access to vitreoretinal care for patients diagnosed with diabetic retinopathy (DR) is even more limited, with services available only at the University of the West Indies in Kingston, the capital city at the eastern end of this 100-mile-long island nation. The means of addressing this shortage of access to care are not clear. Any intervention outside of the capital requires a health care professional to carry all of his or her own equipment and to connect to preexisting sources of patient referrals. Dr. Cunningham found a partner in the Eye Health Institute, which has been organizing medical outreaches to Jamaica since the mid 1990s. Having recognized the burgeoning treatment needs of patients with DR in Jamaica, the institute was actively seeking a vitreoretinal specialist for laser-based outreach efforts. They approached Dr. Cunningham, and he jumped at the opportunity. Figure 1. 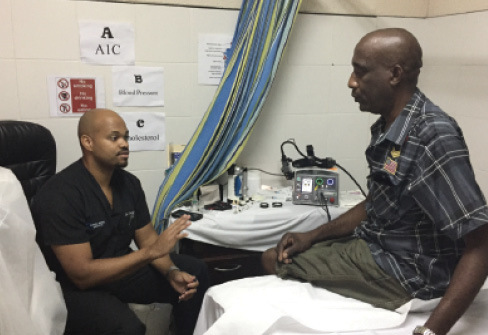 Dr. Cunningham (left) counsels a patient in Jamaica regarding DR and the need for laser treatment. Figure 2. Dr. Cunningham and his equipment, including the portable laser he brought as carry-on luggage. Figure 3. Dr. Cunningham performs panretinal photocoagulation on a patient in Jamaica. 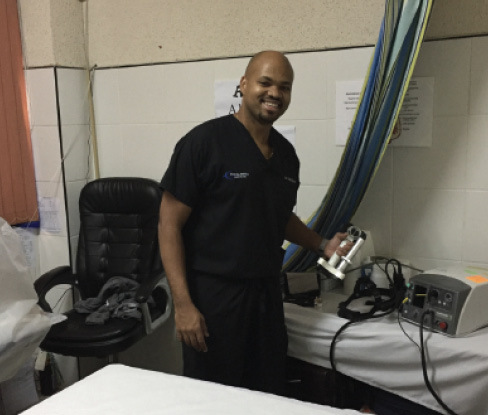 Dr. Cunningham flew to Jamaica for a week in November 2017 to provide laser treatment to patients with proliferative DR (PDR) (Figure 1). As with most short-term outreaches, maximizing one’s intervention involves creating the greatest possible concentration of patients with the target pathology and providing access to the appropriate therapy. Dr. Cunningham had neither a referral network nor a laser in any of the three communities (New Kingston, Negril, and Grange-Kendall) where the Eye Health Institute was planning interventions. To address these issues, Dr. Cunningham and the Eye Health Institute counted on connections with comprehensive ophthalmologists and diabetes associations already in these communities to perform advance screening of patients with diabetes and to identify those qualifying for treatment. They also secured a portable indirect laser that could be transported in Dr. Cunningham’s hand luggage when he traveled from Florida to Jamaica (Figure 2). With these preparations in place, the team headed to Jamaica, beginning their work in New Kingston. Here, pre-screening had effectively identified patients with PDR, and more than 75% of those presenting qualified for laser (although, unfortunately, follow-up from the initial screening was less than 50%). More interventions followed that week in Negril and Grange-Kendall, where, although the pathology of the 40 to 60 patients seen each day was more varied, still more patients with PDR were identified and treated. Patients often received bilateral treatment on the same day. Overall, some 40 eyes with PDR were treated with panretinal photocoagulation during that week (Figure 3), a significant number for a trip that was as much proof of concept as intervention. The next trip is already in the works. Dr. Cunningham’s focus for future trips is to streamline patient selection and expand treatment options. He hopes to meet with and establish relationships with local comprehensive ophthalmologists who can screen for patients in need of vitreoretinal care. He would also like to establish a relationship with a surgery center to allow the possibility to perform vitrectomies in the future for patients with vitreous hemorrhages and tractional detachments. The logistics will be challenging, but Dr. Cunningham would love to have a surgical role in the treatment of retinal issues in Jamaica. He sees the core principle, using high-volume laser outreach visits to prevent diabetic blindness, as both sustainable and easily reproducible, at least in a provisional sense. 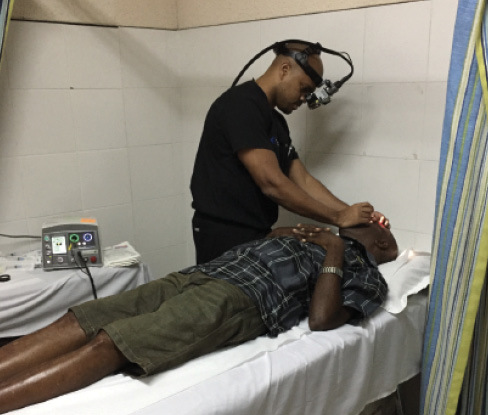 Already looking beyond the current format, Dr. Cunningham envisions eventually training and equipping Jamaican ophthalmologists with the tools to perform these treatments themselves on an ongoing basis. One must recognize that, as each health care community progresses, different levels of involvement for international retina outreaches progress in their appropriateness and efficacy as well. Primary intervention gives way to collaborative efforts that, in turn, lead to skills transfers and educational initiatives that can become self-propagating. Figure 4. 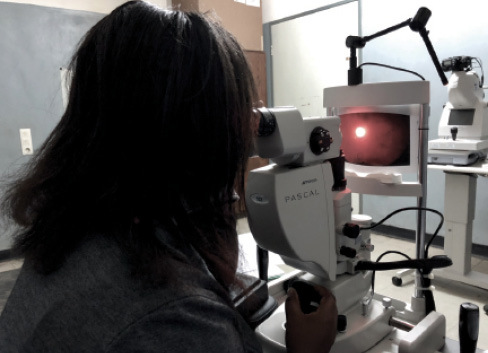 Dr. Mgaya uses a retinal diagram to perform preliminary laser exercises prior to beginning work on her first patient. Figure 5. Dr. Mwanansao performs panretinal photocoagulation on a Tanzanian patient with rapidly advancing PDR. My experience with international laser intervention took me to Mwanza, Tanzania, on the southern shore of Lake Victoria in East Africa. Mwanza is the regional center for the Lake Zone, a geographic segment of northeastern Tanzania with a population of approximately 14 million people who have, until recently, been almost entirely without ophthalmology services. Like many developing nations, Tanzania has seen a precipitous rise in the prevalence of diabetes and its complications, but, for many people, care for DR involves a day’s travel to either Moshi or Dar es Salaam, an often prohibitive burden. 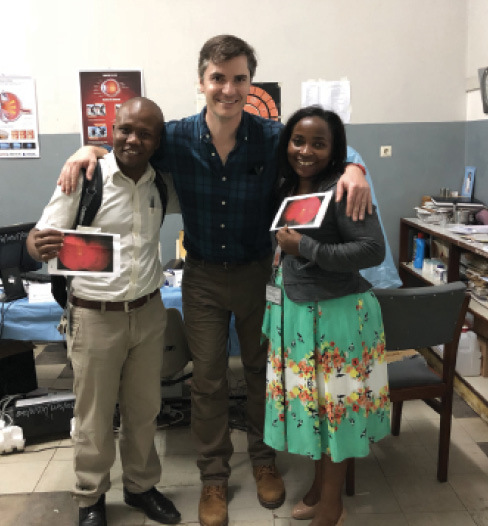 Over the past 2 years, Tanzanian-trained ophthalmologists Christopher Mwanansao, MD, and Evarista Mgaya, MD, have joined the ophthalmology department at the Bugando Medical Centre in Mwanza and have significantly revived ophthalmic services from their previous dormancy. Cataract surgeries have increased 100-fold, trauma care has expanded, and outreach services have been restarted on a weekly basis. Vitreoretinal care (beyond basic diagnosis), however, has been absent thus far. 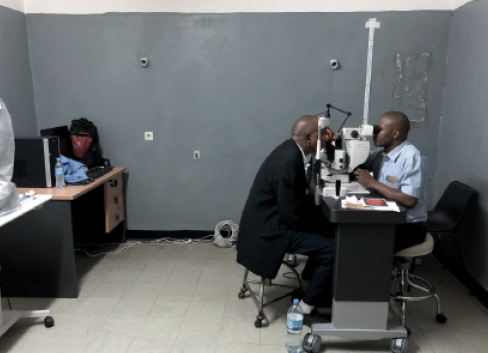 Through the Tanzanian Diabetes Association, which has been seeking to expand care for patients with DR across the country, a Pascal Pattern Scanning Laser (Topcon) was provided to the clinic with a thorough complement of treatment lenses. The hitch was that neither Dr. Mgaya nor Dr. Mwanansao had ever trained on this sort of laser, and the hospital did not have the budget to send them to a training course. This dilemma served as the seed idea for my trip. I would travel to Mwanza from Florida and spend an intensive week working, fellowship-style, with my Tanzanian colleagues, performing laser therapy on patients with diabetic eye disease. Armed with a number of training materials and retinal diagrams, I flew to Tanzania and reunited with Drs. Mgaya and Mwanansao, whom I had met years earlier during an international ophthalmology fellowship. My educational intervention moved through four stages. First, Drs. Mgaya and Mwanansao revisited the core elements of diagnosis and patient selection that lead to appropriate treatment; second, they worked through the practical elements of turning the laser on and choosing the power settings; third, they completed defined exercises for specific pathologies using retinal diagrams (Figure 4); and, fourth, I directly proctored the Tanzanian doctors’ first use of retinal lasers on patients. Figure 6. Dr. Thomas (center) with his Tanzanian colleagues after their first day of training on the laser. Both Drs. Mgaya and Mwanansao advanced quickly, finding the laser interface intuitive and orienting themselves to the inverted retinal images easily after the preparatory exercises. They completed a number of successful treatments for both PDR and retinal vein occlusion that week (Figure 5). Difficult cases provided opportunities for troubleshooting. Most important, not only was a crucial new treatment brought to a population of millions, but that treatment will continue to be available on an ongoing basis, with the Tanzanian doctors now trained and equipped (Figure 6). As our experiences show, a lot of good can be accomplished in a week. Depending on available human resources, staff training, patient referral networks, and actual physical resources (ie, lasers), appropriate involvement may range from a high-volume primary intervention to more intensive education-focused visits. 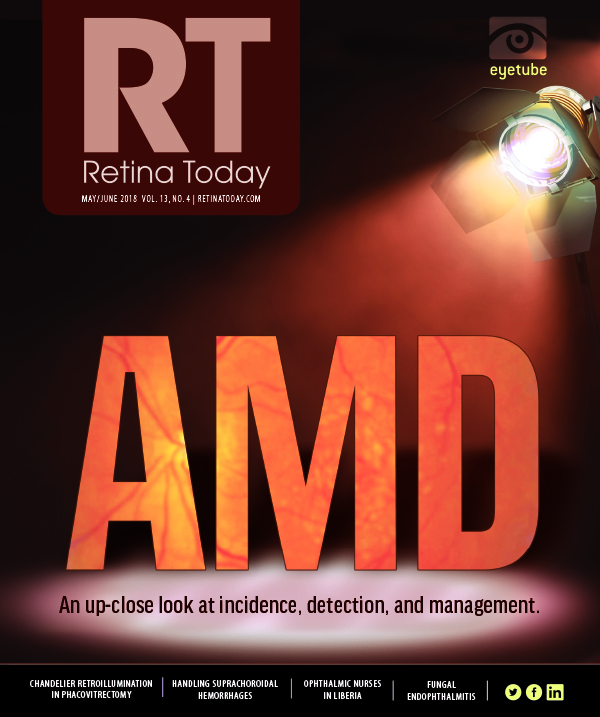 Whatever the case, the bottom line is that retina surgeons have clear opportunities to provide effective interventions in resource-poor environments, even on short-term trips. 1. Diabetes country profiles, 2016. World Health Organization. www.who.int/diabetes/country-profiles/jam_en.pdf. Accessed April 24, 2018.